Israel continues to be one of the hottest destinations for visitors in the world. This winter is breaking all previous standards as a record number of international visitors visited Israel in January and February. The good news was announced by the Israel Ministry of Tourism. Upon the newly released 2016 visitor arrival statistics, it was revealed that an astounding total of 3,068,909 tourists visited Israel, an overall increase in tourism of 3.6 percent compared to 2015. That is an amazing fact considering Israel only has just over eight million citizens. The United States played the biggest role with its 672,071 tourists, a five percent increase from 2015. In fact, the U.S is the biggest contributor to the success of tourism in Israel. Another surprising statistic describes how travelers from Asia have also surged with an astonishing 31 percent increase from 2015. The highest number of Asian visitors hailed from China and India. According to the Ministry, there was a 25 percent increase for the first two months of 2017 compared to January and February 2016. This included a 22 percent increase in tourist entries in February 2017 as compared to February 2016, and a 25 percent increase over February 2015. 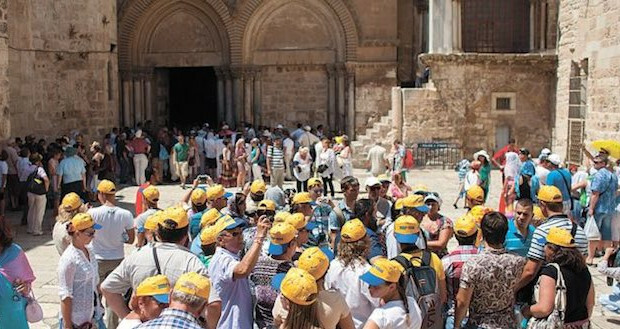 “The statistics show that the ground-breaking marketing campaigns we have created in the last few months at the Tourism Ministry have generated a significant increase in tourist traffic,” stated Yariv Levin, tourism minister. Levin said the numbers illustrated the strength of Israel’s tourism industry. Notably, 209,000 tourist entries were by air, an increase of 19 percent over February 2016 and 24 over February 2015. The numbers came after a flurry of interest in Israel by foreign airlines. Last month, Ireland-based low-cost airline Ryanair announced that the airline will begin service to Tel Aviv from seven European cities, and eight more from Bratislava, Budapest, Krakow and Kaunas to the new Eilat Ovda airport, scheduled to open later this year. The increase in travel from the United States has forced airlines to adjust schedules and add their newest planes to the routes. Beginning May 5, United Airlines will operate one of its Newark-Tel Aviv flights with a Boeing 777-300ER aircraft, featuring the all new United Polaris seats. This will be the second route – in addition to the carrier’s flights between San Francisco and Hong Kong – that will utilize the brand new Boeing 777-300ER. That is a coup for Israel and reinforces it as an important route for airlines. Capitalizing on a growing middle class in countries like China and India, Air India announced it would begin service between New Delhi and Tel Aviv. The service will begin with three weekly flights, but airline officials said they plan to expand to daily flights if and when the demand warrants it. Ministry officials said Sunday that the Indian carrier was attracted by policies to open new markets in the Far East. Industry analysts say that Benjamin Netanyahu’s visit to Australia and resulted in a Memorandum of Understanding between El Al and Australia’s Qantas Airlines for a codesharing agreement to provide smoother connections and streamlined check-in procedures for passengers of both airlines. These are expected to go into effect in the last six months of 2017. Australia’s Minister for Infrastructure and Transport Darren Chester also said he expected the tourism exchange to grow rapidly in response to the new arrangements. “We will continue to consolidate Israel’s position and promote the country around the world as an attractive tourism destination to ensure the continued prosperity and strengthening of the tourism market in Israel,” concluded Tourism Minister Levin.